by Robert Beer, distributed by Wisdom Books, London. The teachings of Buddha Shakyamuni are classified into three vehicles: hinayana, mahayana, and vajrayana. Empowerments or initiations (Tib. wangs) are an integral part of the vajrayana vehicle. No vajrayana practice should be undertaken without first receiving the appropriate empowerment. Buddhism teaches that the root cause of unhappiness and dissatisfaction is our habitual tendency to see ourselves and our world in a narrow, limited, basically impure way. If we could view our minds, our bodies, and our environment free of this mental conditioning, we would discover ourselves to be enlightened and our world to be a pureland. Freed of unhappiness and anxiety, we would be able to extend ourselves to others. How do we make the transition from ordinary to sacred perception? Through the ritual of empowerment, the vajra master shows the qualified student a glimpse of this pure realm beyond the habitual patterns of the mind. Based on their experience during empowerment, students will learn to sustain and expand that initial experience through the subsequent practice of meditation. All the rituals in an empowerment serve one function: to temporarily transform our normal way of perceiving reality. For instance, when incense is burned, it transforms our normal perception of smell. When music is played, it transforms our normal perception of sound, etc. In vajrayana, the various meditations are associated with a particular meditational deity (Tib. yidam), which symbolizes an aspect of enlightened mind. Through the Wang, we are empowered to practice the various stages of meditation associated with that deity. For each different deity practice, empowerment is necessary. The empowerment ceremony itself has many stages, which, though they may vary from empowerment to empowerment, are generally the same. First is the purification of the body: we wash and put on clean clothes. Then, we rinse our mouths with saffron water to purify our speech. To purify our minds, we recite the Vajrasattva mantra of purification (also known as the 100-syllable mantra). Our environment is purified by burning frankincense and through offering to obstructing forces a small red dough sculpture called a gektor. Then, the vajra master may give a short talk on the history of the empowerment and its associated practices. Lineage being very important in vajrayana, the lama will tell when the practice was first taught, how it spread, the renowned practitioners who have attested to its efficacy, and the number liberated through it. This discourse engenders trust and clears doubts. Preliminaries follow. The vajra master recites the traditional verses of that particular empowerment and the students repeat them, usually three times: we take refuge in the Buddha, Dharma (teachings), and Sangha (fellow practitioners). 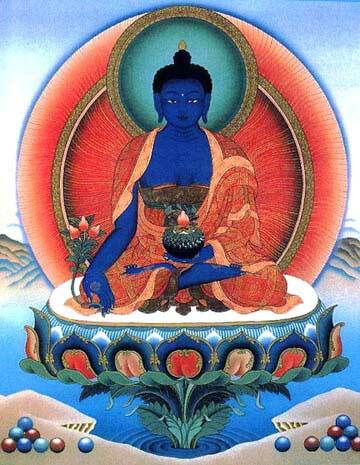 We give rise to the bodhicitta, the mind of compassion. We resolve to take the empowerment and later do the practice in order to benefit all beings. We request empowerment from the vajra master and offer him the entire universe symbolically in the form of a mandala, which is accompanied by a ritual gesture, or mudra. Water from a conch shell will be given to seal the commitment. Commitments in vajrayana are called samaya, words of honor. At the conclusion, the vajra master will give a short talk on the commitments associated with this empowerment and the results of keeping them. During the main part of the ceremony, we imagine both ourselves and the vajra master in the form of the particular meditational deity for that empowerment, and the environment is seen as a celestial palace or mandala. Sometimes we wear a blindfold, symbolizing our ignorance, which will later be removed. We visualize the ``descent of the blessings," imagining countless deities being absorbed into us. At this time, the vajra master usually plays a bell and a hand drum. As far as possible, you should be sitting very still and with a straight back. There are usually four main empowerments within the ceremony. Each involves blessing the student with different symbolic objects such as a vase, a mirror, and so on, each of which purifies a particular obscuration, empowers one to do a particular kind of meditation, and leads to the actualization of a particular aspect of enlightenment. The vajra master will describe the visualization accompanying each empowerment. The full explanation of all this is extremely detailed: usually, it is briefly explained during the ceremony itself. The vase empowerment purifies our obscurations of body. We are empowered to practice the development stage, visualizing the mandala of the Yidam. The result is the attainment of the manifestation body of the Buddha; The Nirmanakaya. This stage of the initiation sometimes has many additional sections. The second empowerment is the secret empowerment. It purifies our speech. We are empowered to practice the mantra recitation, and meditations on the energy channels of the body (Tib. tsa), subtle energy currents (Tib. lung), and essential energy (Tib. thigle). We will attain the Enjoyment, or Radiant Bliss Body of a Buddha; The Sambhogakaya. The third empowerment or knowledge-wisdom empowerment purifies our mind. We receive permission to do practices of union (extensive further instructions are required). We will attain the Truth Body of the Buddha; The Dharmakaya. The fourth or word empowerment purifies the subtle habitual tendencies which give rise to dualistic perception. We are empowered to practice the Dzogchen, the ultimate teachings of The Great Perfection. We will attain the Svabhavakaya, the union of the previous three kayas; The Vajra Body. Sometimes, at this point, there's also an empowerment for activity, or a Vajra Master empowerment.